We are a small, home-based business run by life-long animal lovers and pet owners. We have one aim: to provide your pets with love and care whilst you are away from home. We are extremely passionate about small mammals and can assure you that every animal staying with us will get the dedicated care that our own pets do! Whether it's for just one night or a few weeks, we can ensure your furry friends have a comfortable and happy home-away-from-home whilst staying at Rose Lodge. 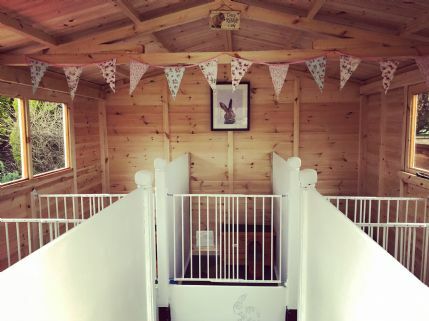 We offer luxury garden boarding for rabbits and guinea pigs in a beautifully converted shed. This is made up of 5 pens (5ftx3.5ft) which all have an access hole to an attached run. This is locked at night to add extra security. We also offer indoor boarding in our home for rabbits and guinea pigs, as well as other small animals. Gerbils, hamsters, budgies etc. will be required to bring their own cage. All animals boarding with us must be in generally good health (unless discussed prior to booking). All rabbits must be vaccinated against myxomatosis and VHD1 to stay with us, and we need to see evidence that they are up to date with this vaccination. We also strongly recommend the second VHD2 vaccination, although this is not vital when staying with us. Rabbits: £6 per night, plus an additional £3 for each additional rabbit sharing the same enclosure. Guinea Pigs: £5 per night, plus an additional £2 for each additional guinea pig sharing the same enclosure. Ferrets: £5 per night, plus an additional £2 for each additional ferret sharing the same enclosure. Hamsters, mice and gerbils: £2.50 per night per cage (up to 3 animals). Rats, degus and hedgehogs: £5 per night per cage (up to 3 animals). Budgies: £4 per night per cage (up to 3 animals). Becky has a real love of animals, and provided wonderful care for our two rabbits. The accommodation is spotless and the rabbits have access to an outdoor run and toys. Becky also kept us up to date with photos of our rabbits which was really thoughtful. We will be using Rose Lodge again and will recommend this service to our friends. My bunnies have stayed twice at Rose Lodge and i can't recommend it highly enough! Becky genuinely loves animals and nothing is too much trouble. My bunnies will definately be regulars at Rose Lodge. Our (Guinea) pigs spent two weeks at Rose Lodge while we were on holiday and we couldn't recommend it enough. They were well fed, watered and cleaned, and we received regular progress updates to prove it! Will be sending them here again. We can be easily accessed from all areas of Sheffield, as well as North-East Derbyshire and South Yorkshire.